Created by Barry LaFond on Feb 18, 2011 3:44 PM. Last modified by Barry LaFond on Feb 20, 2011 4:00 PM. Other than bug fixing, the Teiid Designer 7.3 release included UI changes required to support the changes in how the 7.3 Teiid query engine processes Update queries. This was covered under the TEIIDDES-806 jira. In short, the "Select" SQL is now "analyzed" and validated to determine what "Update" capabilities will be enabled. Also, the previously generated "Default" queries wereremoved and NO SQL is defined if "Use Default" is enabled for Insert/Update/Delete. In addition, the Update SQL validation recogonizes Trigger Action SQL in the form of "FOR EACH ROW" clauses. 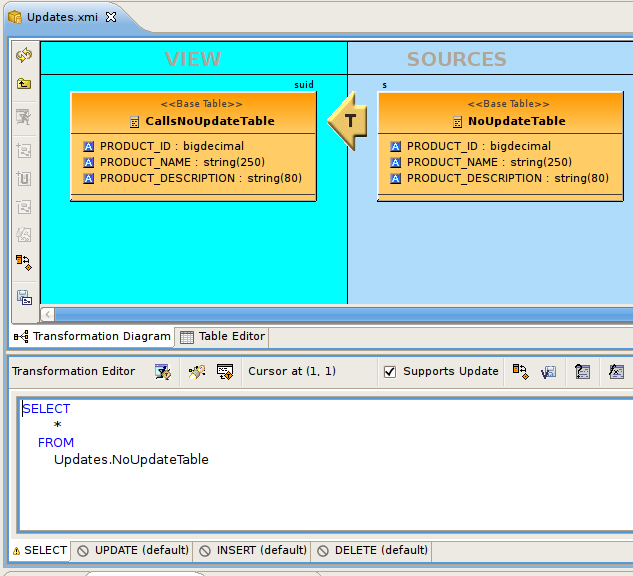 The example show below includes a Select statement who's source does not support updates. Note the Select tab is decorated with a warning and the Insert/Update/Delete tabs are decorated with a "not alowed" symbol and annotated with the "(default)" text indicating the "Use Default" option is checked for each. Looking at the Insert tab reveals more detail about the validation of the Select SQL and the result (errors and warnings). In the case below for the Delete tab, the "Use Default" was unchecked and an invalid Delete SQL was statement was inserted to demonstrate the resulting validation. New Model contributions were added to help create default procedures for Web Service and Text Relational source models. 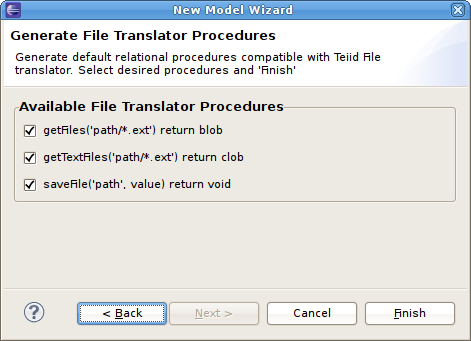 1) Select "New > Teiid Metadata Model"
3) In the "Select a model builder list", choose either the "Generate File Translator Procedures" option or the "Generate Web Service Translator Procedures" option. For Generate File Translator Procedures, you yave 3 procedures options, for Generate Web Service Translator Procedures, you have two procedures to choose from. The usability of the Teiid View was improved in 7.2/7.3 (TEIIDDES-755) including ability to use a custom name for your instance.(TEIIDDES-808). The New Teiid Instance wizard was expanded to include Teiid JDBC connection information as well as Teiid Admin info. This JDBC info is required to enable Preview Data and Execute VDB functionality. The integration of Data Tools Connection Profiles as the connection management framework for Teiid Designer since 7.0, we added the ability to set Text, web service, Salesforce and LDAP connection profiles on source models. This was required to enable Designer to create and deploy the data source artifacts that Teiid needs to perform data preview.